An alleged Indian thief who swallowed a gold necklace is being fed bananas and special liquids in the hope that he will expel it in his excreta. Anil Yadav was caught after a chase by the police and public who accused him of snatching the necklace, worth 63,000 rupees ($995; £648), from a woman. He was put on the special diet after X-ray scans of his body showed the necklace lodged in his food pipe. The necklace, which has a large pendant, has now reached his stomach. Mr Yadav, 30, snatched the necklace weighing 25g (0.06lbs) from a 52-year-old woman as she was walking home in Mumbai's Sion area on Monday, police official Rahul Pawar told the BBC. "After the lady screamed for help, our police patrol and members of the public gave him a chase and caught him," Mr Pawar said. "We searched him thoroughly in the police station but did not find the necklace. Then some people who had caught him told us that they had seen him swallowing something," he added. 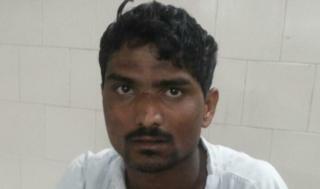 Mr Yadav was taken to Sion hospital where an X-ray revealed the necklace inside his body. Mr Pawar says doctors are now feeding him the special diet and once the pendant is retrieved, it will be handed over to the owner. This is not the first time a robber has been put on a diet of bananas - in 2007, police used a similar method to extract a gold necklace from a thief in eastern India. And last year, Mumbai police fed a man 36 bananas to retrieve stolen property. Doctors, however, say bananas do not really work as laxatives. "The only thing bananas will do is add bulk in his stool," Delhi-based doctor Debangshu Dam told the BBC. "Eating lots of bananas will cause gastro-colic reflex which will make him pass stool. But it's a very primitive method, it's not a scientific thing to do. "I can understand if it happened in a police station in rural India, but I can't understand why would they feed bananas in a hospital when they can easily use laxatives?" Dr Dam says an endoscopy could be a much easier way of retrieving something from a person's stomach. But then, it would require a gastroenterologist and the use of the operating theatre for at least half an hour and that would cost money. "So this is probably the cheapest and the simplest way - but also the dirtiest way." How keen the owner will be to wear the necklace in future is unclear. In the 2007 case the man who swallowed the necklace was made to wash it before the woman it belonged to was given it back.